By TruePublica: From Inter Press News Agency comes news that those with a critical and questioning mind, knew all along when it came to the pretext for bombing Syria due to the alleged and suspected use of chemical weapons by the Syrian government, that something simply didn’t stack up. 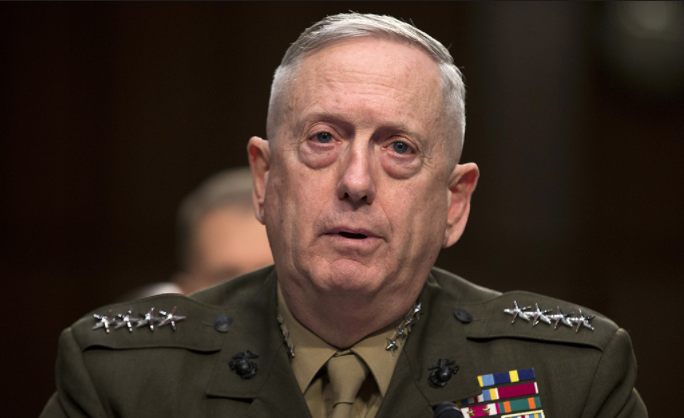 NEW YORK, (InterPressService) – US Defense Secretary James Mattis dropped a political bombshell last week when he said the U.S. has no evidence to confirm reports that the Syrian government had used the deadly chemical sarin on its citizens. Its headline reads: “Chemical Weapons in Syria? Time for Outrage.” The outrage, the report argues, is all about the role of the media. James Norman Mattis is the current and 26th United States Secretary of Defense and former United States Marine Corps general who served as 11th Commander of United States Central Command. He has become known to some by the nickname of “Mad Dog,” and has shown a callous disregard for human life, particularly that of civilians. Mattis has been accused of multiple war-crimes from the siege of Fallujah and Haditha to the horrific legacy of depleted uranium contamination, with stillbirths and birth defects still occurring at astronomical rates, creating a situation so extreme that some Iraqi doctors are calling it a genocide. Mattis is an all-out, single-minded psychopath – he has demonstrated a tenaciousness and enjoyment for killing innocent people in large numbers. Mattis proudly crows “Clearly, the Assad regime did not get the message last year, this time, we and our allies have struck harder” – knowing full well, there was no evidence. Mattis is a veteran of the other propaganda driven wars in the middle east. Meanwhile, Theresa May in full ‘Tony-Blair-45-minute-dodgy-sexed-up-info’ mode along with her Foreign Secretary now described by some of the MSM as both incompetent and a charlatan, supported the American fiction that Syria – on the cusp of winning a brutal war after seven arduous years, was stupid enough to drag in the Western world headed up by gun-toting mad-dog Mattis. The two other desperado’s in this fiction who frankly required huge distractive cover for their own domestic nightmares followed slavishly. But here we have it, no whitewash Chilcot enquiry required – all laid out nicely on a plate. We lied, we bombed – we acknowledge we lied – but what the hell. Nothing to report here in the British mainstream press. Look away. This is an administration who has routinely accused the Syrian government of continuing to use chemical weapons on civilians, which President Bashar al-Assad had denied. The Russians have denied this as well. At TruePublica we can’t you if they have or have not – we can tell you that the evidence that was provided was not corroborated by anyone with any credibility at all and we maintain our position that you CANNOT make such serious decisions as to bring the world to the apex of a global crisis without 100 percent lock-tight irrefutable evidence. The Organization for the Prohibition of Chemical Weapons (OPCW) has still not made any irrefutable claims on chemical weapons use and has been careful with its use of language. The US fired 59 Tomahawk cruise missiles at Syria in response to what it said it believed was a chemical weapons attack last year that killed more than 100 people. It said, it ‘believed’ this to be the case, yet it had no evidence. In Britain, ‘of a type’, ‘suspected’ and ‘highly likely’ is the language of the elite liers. In the current international scenario, these Western governments who espouse civil liberty and human rights to keep them in power, demonstrate far-right tendencies so extreme as to represent little more than fascist ideologies akin to that of Nazi Germany now characterized by dictatorial power and forcible suppression of opposition. All the time they have full access to a completely subservient media to fully advocate their causes. Other war crimes are commonplace. The repetition of using chemical weapons as an excuse for bombing another country is reminiscent of the very same weapons that Saddam Hussain was supposed to be stockpiling but wasn’t. One million people have died in Iraq, millions are still displaced and the end result? Iraq now stands shoulder to shoulder with Iran, Syria and Russia – who could blame them. Was the Western experience of setting the Middle East alight not entertaining enough for the likes of Bush, Obama, Blair, Cameron and Co? Liyba is now run by militias, war-lords and human traffickers – it is truly a hellhole on earth. It also uncorked the Africam migration bottle that is causing the destabilisation of the European project. Is this what America really wanted in the first place – an insecure, erratic and dangerous world that it could navigate better than others where collaboration was leading to prosperity and peace at the expense of American GDP? If nothing else, Mattis has just confirmed something we already knew. Trump, May and Macron are all desperate liers and opportunists. They are deeply embroiled in domestic troubles and so the age-old playbook, with barely any dust settled on its well-worn covers is opened once again. Don’t forget, the real prize for Mattis and his generals is Iran. In April 2016, he said: “The Iranian regime, in my mind, is the single most enduring threat to stability and peace in the Middle East.” Oil, the control of oil, depriving emerging economies of oil is the name of the game. This is why defeating and bringing Syria to its knees and turning it into the next Libya is so important for the likes of the psycho’s in Washington, London and Paris. Expect more lies, more deceptions and more propaganda from the false mouthpiece of the establishment.